Just before Christmas I was on the look out for a 45 deg. ruler to make the Spot the Yo-Yo quilt. Jan had loaned me hers, but I like to have my own things. So imagine my delight when I came across one. I was assured by the shop owner it was 45 deg. but on arriving home discovered it was in fact 60 deg. So instead of returning it, I decided to keep it and design a project. Now I couldn't wait to get started. I was going to make cushions to decorate every conceivable spot inside and outside the house. 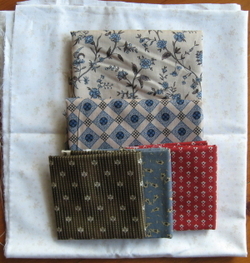 The fabrics were selected and sewn together, the cushions finished....... but where are the photos, I can hear you ask? If only you could click your fingers and the visual image become a reality. 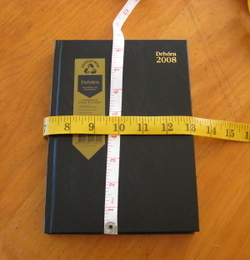 Yesterday, I unwrapped the ruler - it was a start - and today I made a cover for it. And finally, I'm back on track dreaming and planning new projects, only this time I'm going to make sure they become a reality. How not to reduce your stash! This week I finished another little quilt. 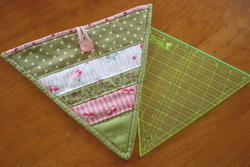 It was driven by a need to start using the 2 inch squares I found in the cupboard. How wonderful, I thought, if I could use them all (well most of them) in a small quilt. So I sat there, sorted them, laid them out, rearranged them, cut some more...... then put them aside till the next day. 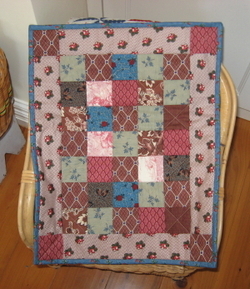 Then I remembered a beautiful quilt I'd seen in The Quilter's Resource Book by Maggi McCormick Gordon (Page 97). I could do this, just much smaller. There were plenty of red and blue and cream squares already cut, or so I thought. Now truth be told, and this makes me laugh, I didn't have enough of the RIGHT coloured squares. Yes, I had plenty of the cream but I didn't like them, and no light brown squares. So what to do:- I cut some more. ONLY from my stash, I hadn't totally lost my focus. How many of those pre-cut squares did I manage to use, I can hear you wondering? Well let's just say that I think overall I did manage to reduce the number, but not by many. And the binding and backing were from my stash. So far so good. But how to celebrate the reduction in the stash and a finished project. The only way I know how. I bought more fabric! I just can't stop making little quilts. I'm totally addicted. This and the desire to use up every scrap of fabric I possess. Totally unrealistic! There will always be a new project with fabric left over that will find its way to the scrap bag. The truth is, I might have more success at removing every weed and rock from the garden. But knowing this doesn't stop me from trying. And how much nicer to have the fabrics on display rather than tossed in a bag. 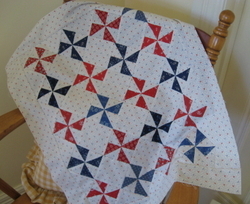 The top is pieced entirely from scraps. Even the binding! There was just enough binding left over from two other projects. Now to the truth. I did buy the backing. Jan is culling her fabric and had the perfect piece. Does this count as a purchase? Helping a friend reduce their stash! For Christmas, I was given an Antique Doll Kit. I never knew how wonderful a kit could be with all the blocks precut for you. True bliss, especially after all the cutting in the one above. And so quick to put together. I managed to finish the top while watching the tennis Friday night, between changes of end. I love projects that can be finished in next to no time at all. So what am I working on now? More yo-yos, Christmas decorations, applique - NO! 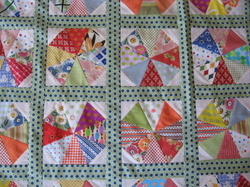 After working with precut blocks I decided to do something with the 2 inch squares I found hiding in the cupboard. So yes, another little quilt. Here is my 2008 Diary cover. There is no pattern, but I thought you may be interested in covering your own diary. It's very easy. 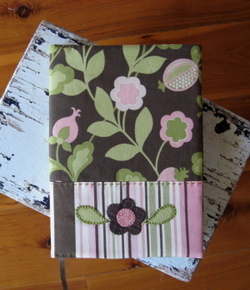 Start with your favourite fabric, and in no time at all you'll have a pretty cover for your diary. The secret is in the measuring. Remember to add your seam allowance and a little extra (1/4 in) for the thickness of the cover. You can adapt this pattern to fit any size diary. This is the diary I prefer to use, A Day to Page (A5)- lots of space to write all the things I need to be doing. You can see why I like to cover it, hardly inspiring. You will need a floral print, a stripe, iron-on-pellon, fabric scraps for the flower and leaves, vliesofix for the applique and stranded embroidery thread. 1. Measure your cover. Mine measured 8 1/2 x 13 inches. Adjust the following cutting directions as needed. The cutting measurements include a 1/4 inch seam allowance. 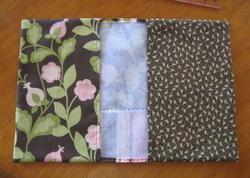 From the floral print, one 13 3/4 x 6 1/8inch rectangle for the outside and two 6 x 9 1/4 inch rectangles for the inside flaps. From the stripe, one 13 3/4 x 3 5/8inch strip for the outside. From the iron-on-pellon one 13 3/4 x 9 1/4 inch rectangle. 3. Join the stripe and floral print together. Press the seam towards the stripe. 4. Fuse the iron-on-pellon to the wrongside following the manufacturer's directions. 6. Place the applique pieces in position. Fuse in place, then whip stitch around the edges using two strands of matching embroidery thread. 7.Work a row of running stitch alongside the seam line. 8. 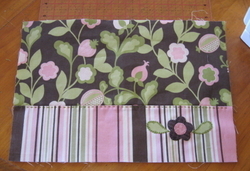 Turn under one long edge on each flap by 1/2 inch and sew. 10. Turn right sides out and press. 11. Turn the raw edges over and work a row of running stitch across both. 12. Slip the cover on your diary. I woke this morning to find I have my energy back. It has been so hot, 24/40 deg. celsius, it was even difficult to keep sewing! The days are still warm, in the 30's, but the nights are much cooler. Now all we need is a little rain. 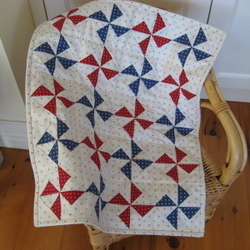 I did manage to finish the pinwheel quilt. 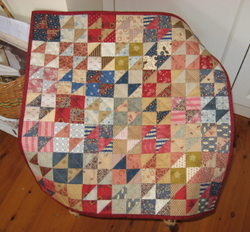 I wasn't sure what to do with all the little quilts I plan to make, but I've decided a stack of them on a small chair could look rather gorgeous. I am rather partial to blue/red combinations at the moment. How fickle am I? Last month I loved the brown/pink/green City Girl fabric, then it was the blues/browns/golds in the Spot the Yo-Yo quilt, then it was the 2 metres of yummy red and now I am going on about blue/red combinations. Who knows what I am going to love tomorrow! This is Browyn's quilt top. We both feel in love with same background fabric, and carried away on a wave of enthusiasm decided to 'go home and make a quilt that afternoon'. Now we didn't achieve this goal, but we have mananged to finish them in under a week. Where I used the same red and blue fabric, Bronwyn's hunted through her stash and used her red and blue scraps and added a border. It's great to see how they both turned out. 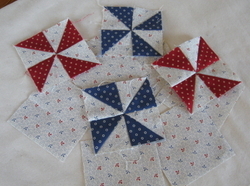 Think the pinwheel is my favourite block now! 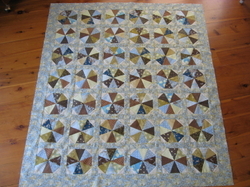 No I haven't finished another quilt top, though I wish it was mine. This is Bronwyn's, finished earlier in the week. There are already plans to make a second one. If you would like to read more about this quilt (designed by Jan Manglesdorf) see previous posts dated 10 December and 2 January. Only the other day I was talking about using up my stash and exercising restraint with fabric purchases. I know I cannot go for too long without buying fabric. But I had thought I might have managed to resist the urge for a week at least. So perhaps it is time to acknowledge I may have a problem. I went fabric shopping on Tuesday, then Wednesday and again today. I only planned to buy a couple of backgrounds on Tuesday but couldn't resist including the pinks and green spot. And that was what I bought. Now here is where I made a mistake. As soon as I had paid, I should have left the shop but instead I kept browsing, while Bronwyn made her purchase, and came across the beautiful red (from A New Nation range). How had I missed it? How much should I buy? So out came the credit card, again, and into the bag went 2 metres of this to die for red fabric. Off to Beechworth on Wednesday and I found this lovely little red and blue background print (Judie Rothremel). Now I wasn't sure how much fabric to buy because I only had a vague idea for a little quilt with blue and red pinwheels. Of course I purchased a bit too much. I had to buy the blue as well, but the RED IS FROM MY STASH. Today, I was thinking about the projects I needed to work on for classes and found inspiration in these pieces. I just remembered I bought another piece today. 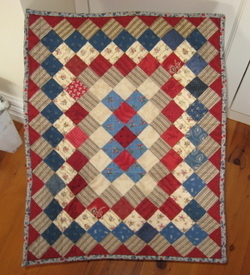 A very fine blue and red stripe to back the little pinwheel quilt. Now my goal still is to use fabrics from my stash. I just need to get the ratio of stash:purchases a little higher. It's impossible for me to throw out scraps of fabric. I've tried cutting left over pieces up into squares or strips and carefully placing them in containers and this works really well for the first week (day) before I slide back into my bad habits 'of shoving them in a bag'. I keep tiny pieces telling myself I may need it one day for an applique flower centre and narrow strips that I will definitely use to tie around a gift.....like never! I don't even like some of these fabrics anymore. Some fabrics have been used in two and three projects in an attempt to 'get rid of them' but there always seems to be a bit left over. (And how frustrating when you think you've finally succeeded in eradicting a fabric and a week later you find another piece lurking in one of those containers.) Why doesn't this happen with the fabric you're just a little bit short of? So what to do about all those scraps. 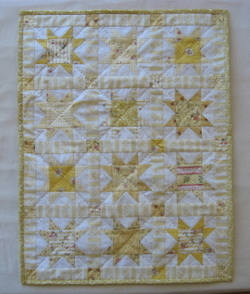 On the weekend I decided to make a little quilt out of my yellows. Now I wish I had taken a little more time with this. 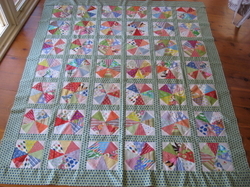 I made the blocks, laid them out, moved a couple and then sewed them. When I'm not on a self imposed deadline I would usually make a spare block and see which combination worked best. But I didn't, and so I'm not completely happy with the finished product. Still really like it, but think I could have done better. Next quilt, I plan to 'let it rest' for half an hour before sewing. 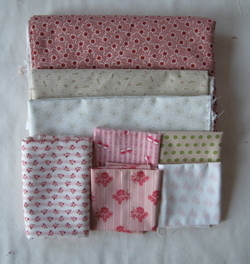 And there will be a next one, as I'm inspired to use my scraps in little quilts. The mind is already ticking over, perhaps I could make six this year, different colours, blocks, layouts. I'm really excited, as it provides an opportunity for me to play with different colour combinations and designs without a huge investment in time and fabrics. Realistically this will only use a small portion of my scraps. But just maybe, once I've used them in another project, I'll find the courage to say 'enough' and clear them out. One of the first projects I make each year is a cover for my diary. 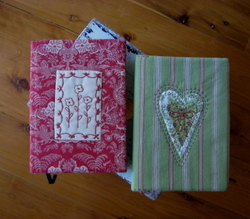 There is a degree of urgency about this project as I'm very reluctant to use the diary until its covered. Here are the 2005 and 2006 covers. Each year I have to do something a little different. A stitchery or applique and always with a favourite fabric. As I use it everyday it needs to be covered in something I love. Sometimes you can overlook a fabric until you see it made up. This was the case with the red. The next time I visited the shop I bought what was left on the bolt. Now I'm not sure if I was lucky or unlucky (my wallet was a winner) but there was only 50cm left. I only had a Fat 1/4 of the green stripe and I agonised for ages about what to do with it. In the end I decide to 'just use it'. And as my diary cover, I got to look at it and touch it everyday. So much better than leaving it in the cupboard for that elusive 'special' project. How many pieces of fabric do I own that were 'must haves'? How many of them have never been cut? Too many! Last year I became addicted to punch needle. 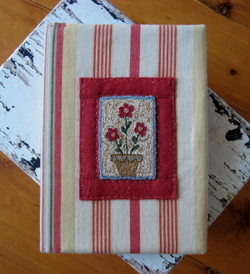 So it was only natural to decorate the 2007 cover with a punched piece (Pot of Flowers pattern). Now one of the most frequently asked questions is 'Does it come undone?' And the answer is 'No, it doesn't'. My diary is proof that it will not 'pull out'. Used just about every day last year and not one loop out of place! The fabric choice for 2008 was very easy. 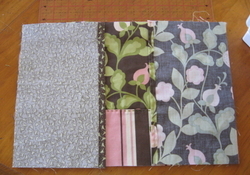 I love this City Girl fabric and there was just enough left over from the bag I made and gave (reluctantly to) Jan. It's the simplest and quickest cover of them all. Normally a needle-turn applique girl, I used vliesofix and whip stitched each piece in position. The leaves were fussy cut from the City Girl fabric. Now I'm not sure that New Year resolutions are such a good idea. For me, they last about 5 minutes, OK, a week if I'm lucky. So this year I am not going to make any. Instead I will try to do either MORE or LESS of the following things. Only this morning I went outside to toss the shower water on the garden, and before I knew it, I was pulling up weeds, minus the gloves. Even the lovely gardeners hand scrub with pumice doesn't remove all the stains. So I will try to wear my gardening gloves MORE often. Last Saturday, Bronwyn and I went shopping for fabric for her stash. Now this was a good thing I thought. Choosing fabrics for someone else to buy. Satisfying the desire for a little retail therapy while costing me nothing. And this is what I bought. 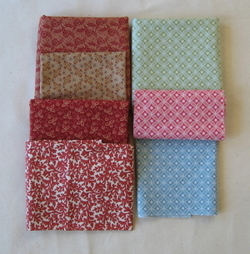 Nine pieces in total, two have already been used in the quilt I am making. So in the future, I will excercise MORE willpower to purchase LESS fabric. But already I can feel myself weakening - what if it's a red fabric, that I just have to have? There are some jobs around the home and garden that will take all of 2 minutes but can take me two months or more to do. Why, I ask myself? The stake on my potted olive tree needed replacing. It had snapped off at the base and the tree was leaning over causing me to dodge around it everytime I walked past (which is often). It took less than two minutes to fix. This year I will spend LESS time thinking about these little jobs and therefore get MORE of them done. Starting tomorrow morning I will repot the succulent my daughter reversed the car over. See succulents aren't just drought tolerant. I will try to do my bookwork MORE regularly. I will have LESS unfinished projects at year end. I'm already feeling confident about this one. Here is the finished quilt top. Started last year on Boxing Day. Surely I will be able to get it quilted and bound this year. I love this quilt, I know I say the same thing about all of them, but this is the first quilt I've made using a 45 degree ruler and the colours are not my usual choice. Its wonderful to have a quilt a little different from the rest. Now if I don't start anything else this year I have already achieved this goal. There will be LESS fabric in my stash, since I will be using MORE of it in my projects. Now I'm not sure how to measure this. I'm not going to stocktake my last little square. Perhaps if I can get the lids back on the containers at year end and stacked nicely in the cupboard! Now I am not sure how successful I will be achieving these goals in 2008, but two things I know for certain, I will be making MORE Yo-Yos and posting MORE blogs.